Brightly coloured green pan with blue frame and matching green handles and wheel. 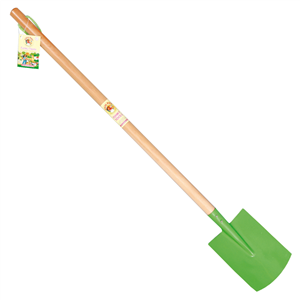 Childrens gardening tool set for all round gardening fun. 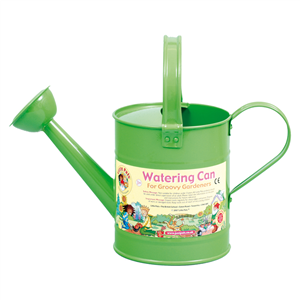 This childrens wheelbarrow garden tools and watering can set is an ideal gift for any time of the year for budding young gardeners. 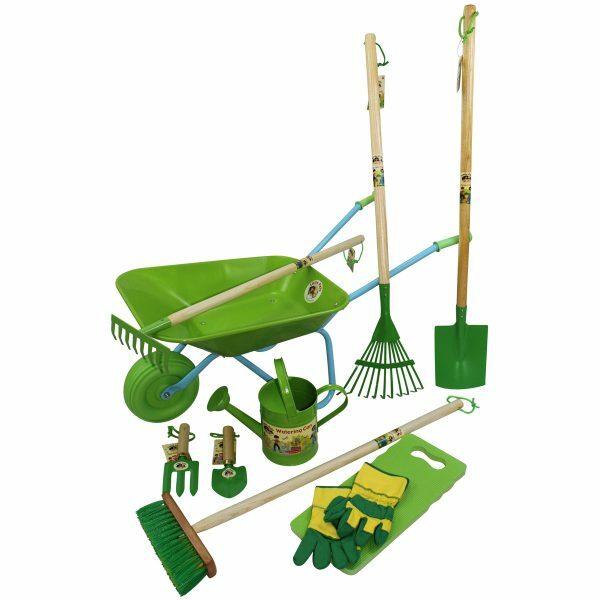 The set contains a wheelbarrow, together with a metal spade, garden rake and leaf rake both with bright green heads and sturdy wooden handles. 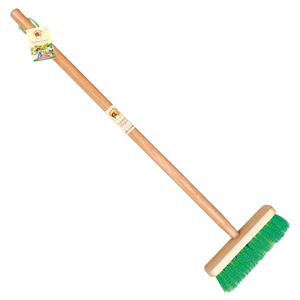 There is also a childrens broom, ideal for sweeping up the leaves. All the long handled tools have useful hanging ties. 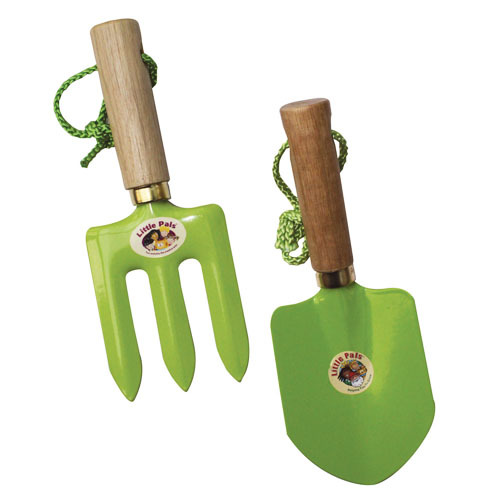 Two hand tool are also included; a smart trowel and fork with matching green heads and wooden handles. There is a matching green watering can with fixed spout, and a little kneeling pad just like the grown ups! 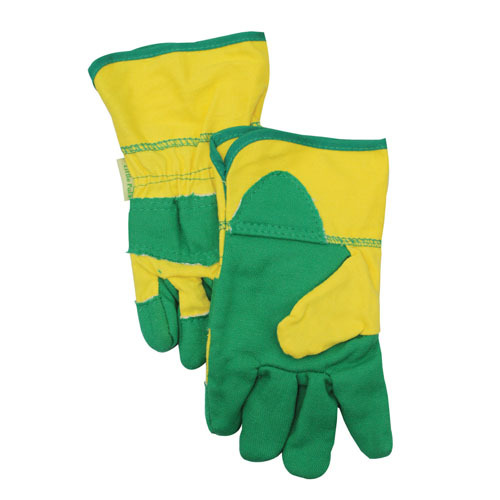 The childrens gardening tool set is completed by a pair of cotton childrens gardening gloves in green and yellow for protecting little hands in the garden. The gloves have a reinforced cuff and fingertips as well as extra protection over the knuckles. 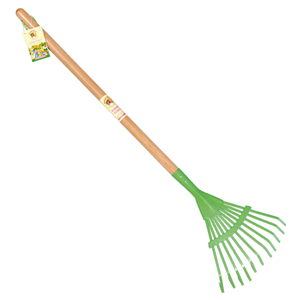 The spade measures 85cm long and 12cm wide at the head, the leaf rake measures 85cm long and 22cm wide, garden rake 76cm x 15cm and broom 76cm x 20cm. The trowel measures 20cm long and 7cm wide, and the fork measures 19cm long and 7cm wide. The watering can measures 13cm in diameter and 29cm from handle to tip of spout. The kneeler is 15cm wide, 30cm long and 1.5cm thick. 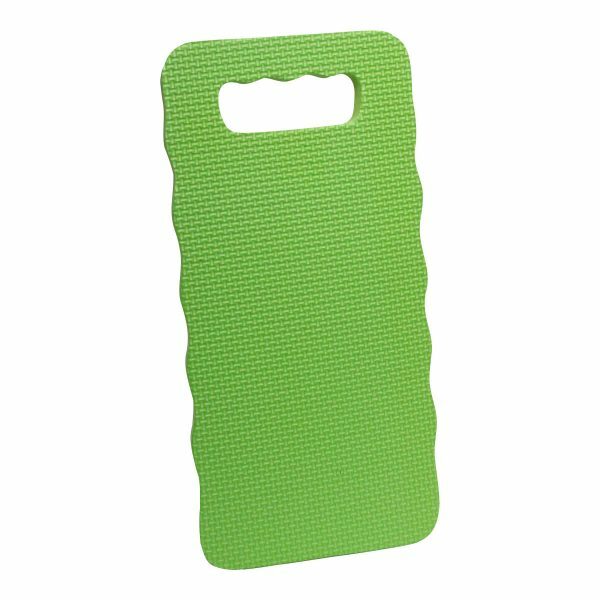 The childrens gardening gloves are approximately 18cm in length from fingertip to wrist and 8cm wide. One size fits up to approximate age 10 years. 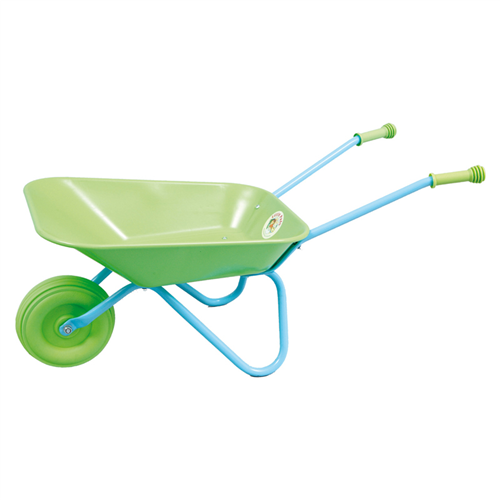 A lightweight metal construction, the childrens wheelbarrow has soft hand grips and a chunky plastic wheel with a brightly coloured green pan and blue frame with matching green handles and wheel. 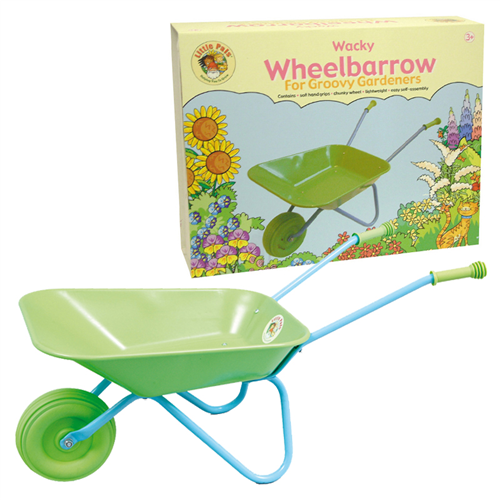 Ideal for helping out with all those important little jobs, this childrens wheelbarrow is easy to self-assemble. Full assembly instructions are included. Perfect for collecting leaves or simply pottering around in the garden, children will have endless fun with this sturdy wheelbarrow. 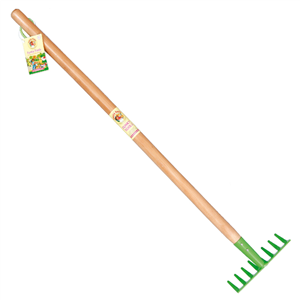 The gardening set makes an ideal gift for your budding gardener at any time of the year.